Article 6(4) lit. 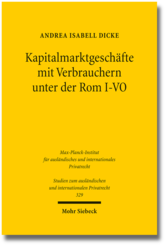 d) and e) of the Rome I Regulation establish various capital market-related categories which are excluded from the general consumer protection under the special conflict of laws rule for consumer contracts in Article 6 of the Rome I Regulation. Andrea Isabell Dicke examines the scope of application and practical relevance of this exemption provision.